The Lone Star Ginger: Wonder Woman Wednesday-Oh Snap! What's for Dinner?! Wonder Woman Wednesday-Oh Snap! What's for Dinner?! If you are new to the blog, Wonder Woman Wednesday is all about building you up. It's midweek, I've "screwed up" countless times, forgotten something important, etc. Whatever it was has messed up my week and I am bummed. (Insert the Wonder Woman Wednesday blog!!) Once I start writing this particular blog, I immediately start to feel better and realize the mistakes weren't that big of a deal. For this blog I will change up the dynamics a little. I will start to feature real life Wonder Women, organizing tips (that I have ACTUALLY tried), quick recipes (that I have ACTUALLY tried) and motivational "stuff" to get you through the week. So for this week, I thought I would give you my tried and true tips for organizing a meal plan. Don't you hate it when you get home late, and you are scrambling to make dinner from apple pie filling and a can of green beans? (Completely hypothetical!) With school starting back up, most of us are going to be running on fumes by mid-September. Kids' activities, homework, housework, work, etc all get in the way of you making a fabulous meal for your family at least 5 nights a week. Last January, I decided I was going to make a meal plan for the entire month! I found that my grocery bill was cheaper (on average $50 cheaper a week!) and my stress level was decreased. Now before you start with the excuses of why you can't prepare a month's worth of meals, let me stop you. Yes you can! I have a husband, 2 kids in sports and run two small businesses so if I can do it, so can you. Take one Fri or Saturday night, sit down with all your family's favorite recipes, your calender for the month (with the extra activities on it... ie, games, practices, etc), your Pinterest board of recipes and a piece of notebook paper. Number your paper 1-31 (or however many days are in the month) and just start writing dinner plans on each line. If you won't be home one night for dinner because of Johnny's football game, write "EAT OUT" or something like that. I think my first meal plan took me around 45 minutes to plan. The months after that were around 30 minutes or less. Now that you have a meal plan, create a notebook with ALL those recipes in there. (SIDE NOTE: I made my sister one for her birthday that was categorized: chicken, meat. pasta, sides, desserts...) That way you have one spot to gather all your ingredients for the grocery list. I usually grocery shop on Fridays so I make sure to sit down Thursday night and make my list. 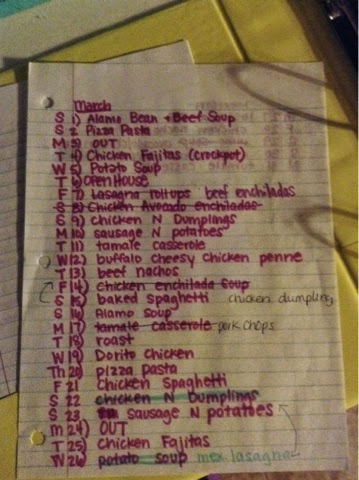 I get out my handy dandy recipe notebook with my month's meal plan and write out my list. I double check the pantry and fridge to make sure I don't buy too many duplicates. I pull out coupons that go with items on the list. I also make a note beside the item on my list that I have a coupon for it. Here was my March meal plan. As you can see there are scratch out marks from changes that were made through the month. If I try out a new recipe and we DO NOT like it, I scratch it off and it never comes back! I try to keep easy quick meals during the week and more labor intensive ones on the weekends. So there you have it! How to prepare your meal plan for the entire month!! You eat out less, less impulse buy at the grocery store and your family is healthier!! Hope this helps you out as the kids start back to school and the schedules get busier!